The destruction of unpleasant and harmful chloramines in the water. The first, and one of the most important properties that determine the effectiveness of a UV system is the nature of the ultraviolet radiation used to treat the pool water. Let’s take a look into the nature of UV light, to understand how it determines the effectiveness of a UV system. The most important thing that you should know is that the nature of UV light is determined by wavelength. Radiant energy like sunlight or radio waves travels through space in waves. If a beam of radiant energy is measured, the levels will continue to rise and fall gradually and reach a maximum and minimum value. Those levels will perpetuate into a cycle in a regular series of crests and troughs. The distance between any two crests or any two troughs is known as the wavelength and is measured in metres or decimal fractions of a metre. 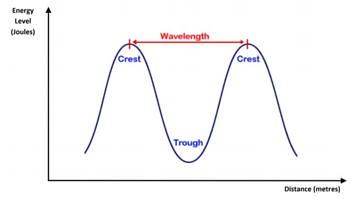 What is the wavelength of UV light? The particular electromagnetic radiation that we call ultraviolet (UV) occupies a band of wavelengths in the electromagnetic spectrum between visible light and X-rays. Ultraviolet radiation (also called ultraviolet light) is considered to have a wavelength of between 400 x 10-9 metres at the visible light end and 10 x 10-9 metres at the X-ray end of the electromagnetic spectrum. 10-9 is one thousand millionth of a metre and is usually referred to as a nanometre (nm). As far as disinfection effectiveness is concerned, views are pretty uniform: Maximum disinfection occurs when a UV wavelength of 254nm is applied at a dose of 30 – 40mJ/cm2, as is the case with low pressure UV lamps. The disinfection effectiveness of low pressure UV systems is very high. So, which wavelength is the most effective for UV systems? Experience has shown that the UV that is most able to do this has wavelengths in the UV-C band. This waveband is sometimes referred to as the “germicidal waveband”. Within this band, peak germicidal effectiveness is obtained with UV wavelength of 260nm. Apart from the factors that directly influence your selection of UV system type, there are some other important factors to be aware of. These factors, when neglected can have a negative effect on the overall effectiveness of the UV system. Become a trustworthy adviser on pool sanitation — read the full report about UV Systems.